Originally I started "The Setup" as kind of a joke .Just put some sloppy objects together, and show how a still life looks before it is painted.It soon became clear that it was not that simple: even objects thrown down in a messy way have their own order. As an artist it is a joyful experience ever so often to visit the long outmoded Newtonian universe in which everything is fixed. Everything. Colours, backgrounds, contrasts , those are the things that I can still play with, unhindered by dogmas and theories, and can still provide the necessary surplus.So it was yet again a tightly directed play, with items that would not move an inch from their position as if they were rigid actors.Transparant or stretched, faded or violently coloured: equal and yet different. All tlhese different aspects are measurable, with the right kind of measuring equipment. It is all mathematics. Peppered of course with details: shadows and reflections, the allies and servants of the crystalline reality, and where they overlap, they reinforce another. The blue glass reflects twice in the glass bottle. When you look hard you will find the gable of the neighbor. 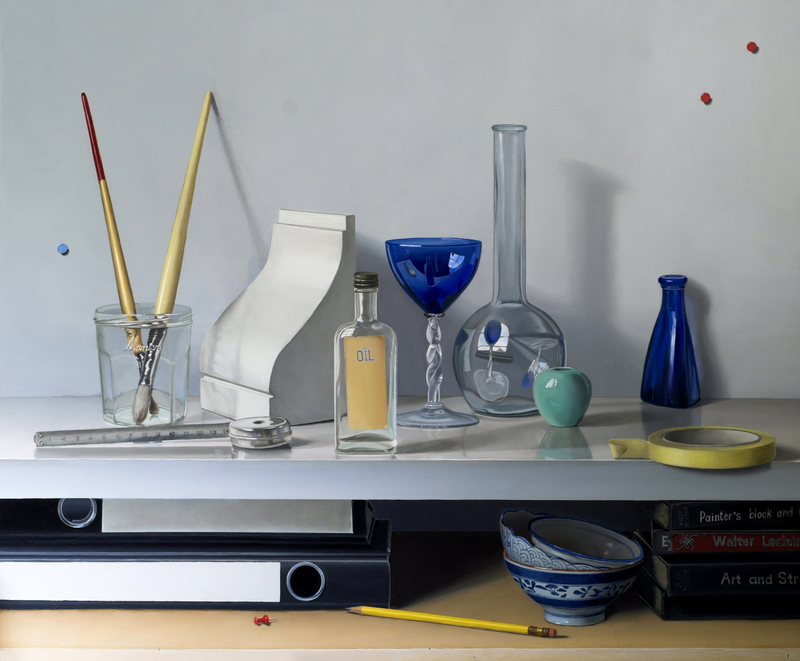 In the small turquoise vase there is a reflexion of the window and at the same time of the bottle in between them. The bristle brushes in the "Maman" jams and jellies reflect in the shiny surface, beneath it. The tape measure, in turn, reflects in the blue glass. The rubber eraser is attached to the end of the pencil with a copper ring, note the two small notches with which the washer, in turn, is attached to the pencil. The side of the console ornament is just about as dark as its background to the extent that, for a centimeter length or so, the two are nearly indistinguishable from one another. That I think is the best part of the painting, it really looked like that. That is why I paint, for the surprising tricks, trompe l'oeil, apparent possibilities and seemingly impossible realities that the universe has in store for us. Since Einstein we know that light consists of both particles and radiation. In our spacetime continuum nothing goes faster. It is the mystery itself . It will never cease to fascinate us.